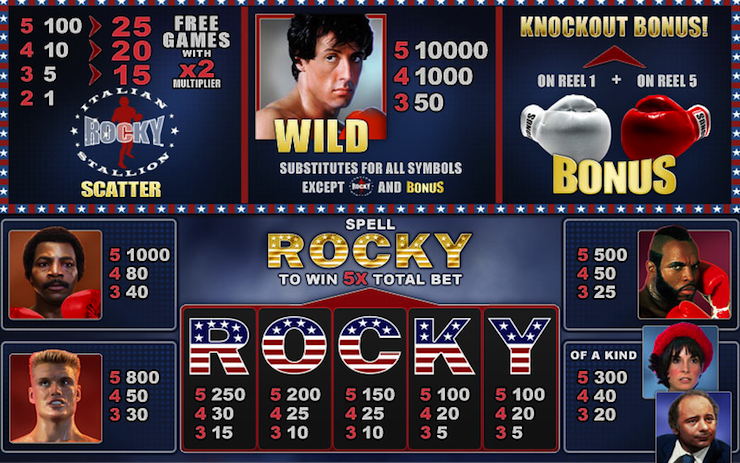 The 5 reel and 25 payline Rocky slot game is based on the fantastic Rocky films. Although the Rocky slot game doesn’t come with a progressive jackpot, it offers a lot of generous cash prizes. Rocky is the wild symbol and if you hit 5 Rocky symbols, you will get the maximum payout of 10,000 coins! The Rocky slot offers some impressive bonuses! If you hit three, four or five Italian stallion scatters, you win 15, 20 or 25 free games, respectively. Moreover, 2x multiplier is activated during the free spins. You can also benefit from the Rocky bonus. If the letters R-O-C-K-Y appear across the screen in that order, you win five times your bet! One more bonus you can take advantage of is the gamble feature. If you want to further increase your winnings as you play, push the Gamble button. If you guess the card color (red or black) right you double your money, and in case you`re wrong you lose your win. If you find this game review not enough and want to try it yourself, you`re welcome at our site, where you can play it for free, without registration.